Somedays I feel like an ancient in the guise of a young man. Then I do some of the impossibly daft things I am wont to and I realise that nah, I'm your average bloke, the nameless face you walk by on the street. I live in Malawi. I didn't grow up here but I have always been from here and have now returned and settled in. It is a place of remarkable contrasts in some ways and mind-numbing sameness in others but it's home and that has come to mean so much more in light of the events of the past week. There is a saying that aptly describes what has happened; The worm has turned. As the entry for it on xomba explains, it is a common idiom used in reference to a situation in which a downtrodden individual or group turns on it's oppressor. The metaphor originated in the sixteenth century and is best known for its appearance in a Shakespeare play: "The smallest worm will turn, being trodden on." A quick snapshot of life in Malawi in 2011 is required. Fuel shortages that make life harder (and more expensive) for just about everyone; the other day I could barely find a bus back to Lilongwe from my hometown Mzuzu because they all ran out of diesel. Forex shortages that exacerbate the fact that we are a net importer. Electricity outages that affect industry and more personally are an inconvenience I would much rather do without. A parliament that passes bills without due scrutiny and with superficial consultation. Laws that infringe the very rights they are meant to uphold. A political landscape that is increasingly more fractured, where even the colour of your clothes will determine how you are treated. A disregard for diplomatic norms and international opinions that ultimately only disenfranchises the very poorest of the poor. Media outlets that are either lauded for spouting drivel or experience punitive measures for reporting objectively. Drug shortages, faltering markets. A crushing sense of loss at opportunity missed . How quickly the euphoria of a landslide election victory and the optimism that a new and strong government with a mandate to implement its promises has turned into disillusionment and mistrust, disgust even. 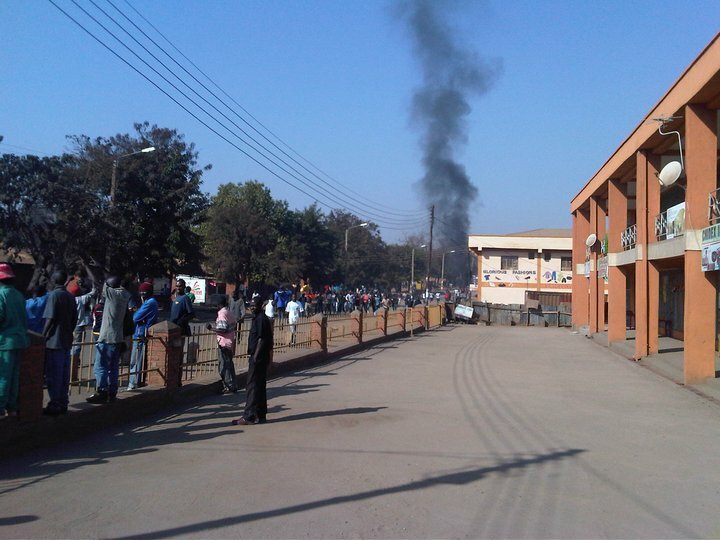 All the more so when the day before planned peaceful demonstrations youth from the ruling party took to the streets of Blantyre in party vehicles and colours brandishing machetes and spewing vitriol. So I boldly got up on the 20th of July 2011, donned my red regalia and set out to add my voice to the rumble of the disgruntled masses. As I arrived at the bus depot I found a troubling situation. The very same police force that had only the evening before announced they would not hinder the peoples' right to peacefully demonstrate were arresting them and beating them if they resisted! As the reality of the fact that we would NOT in fact be allowed to march settled in, pent up frustration started to manifest with roadblocks of burning tyres being set up to hinder the police vehicles that were careening around with officers armed to the teeth and in camouflage as if embarking on a military campaign. The situation deteriorated quickly where I was and as the reports came in of similar unrest in Mzuzu, what had merely been spats turned into running battles. Having been in similar situations in other countries before I decided to get while the getting was good. An injunction to stop the demonstrations had been granted to a misinformed individual the night before and was the cause all the current fracas. This was being battled in court and would soon be lifted. With no guarantee and the first indications of looting beginning I retreated to the safety of my home with the full intention of returning to march when the go-ahead came. Yet as I listened to the radio my spirit sank. Full riots were breaking out and as is the nature of riots the destruction of property had taken the forefront. Forceful retaliation with live ammunition had already resulted in some deaths. Chaos reigned. A close personal friend of Asian descent called me in tears having just watched his investment vanish before his eyes. Suddenly radio silence. A quick foray onto the Internet yielded results. Private media had been issued a gagging order by the regulatory authority. Meanwhile on the national broadcaster a public lecture had begun. In a stroke of pure poetic justice the power cut out at the State House from where the events were being broadcast. It was restored in short order and I watched in disbelief as the lecture continued as if all present were oblivious to what unfolding nationwide. Night swiftly came and went, reports of more violence came in, targeted destruction of property, even whispers of xenophobia as Asian and Burundian businesses bore the brunt of the looting. Curfews were imposed and calm gradually restored but even now there remains an underlying tension that is palpable in its intensity. As the press statements fly and speeches are made the worry becomes how long it will be until the worm once again turns? The year that was, 2010 and nary a post on my blog in bleak testament to procrastination's encompassing power. Not that it was an uneventful year, perhaps even more so as a result. Too much going on, no time to pause and reflect. I forgot to smell the flowers. As I look back though a lot of things went right and I therefore have a lot to be thankful for. Some things went wrong too and those lessons need to be learned and retained. The weave of wonder through it all, like a single faerie gossamer string threading it's beauty and lending lustre to all around it was the development of a child. The leaps and bounds as we communicated, and I started to realise how little I knew of how much he understood all along, breathtaking. This perhaps being the essence of all things. Continuity. Seeing a young mind ravenously acquiring and processing new information. To nurture such is an all-consuming yet infinitely rewarding task whether or not it be acknowledged. Time marches on, 2011 now. All sorts of plans, hopes, dreams. At least I got a post in. I was talking to a friend who is now a well-seasoned bachelor and in the majority of opinion WELL overdue for the African way of spawning a brat, settling down and tying the knot and YES in that order, it's a new world so welcome to the new Africa! However, almost as if by rote we one-by-one started to slow down, start behaving rationally and now as if by magic have turned into responsible family-men and are on-course to becoming that most dreaded of things, accomplished adults. So from my now seemingly lofty perch (yes, said bachelor is still tripping the light fantastic), I decided to wax benevolent with wisdom and counsel my misguided buddy into more sober ways. The analogy I struck upon was that of a 5-speed gearbox. Therefore when we first start working we're in gear one. Then we get used to earning a regular income and invest in creature comforts (the acquisition stage), move house, buy clothes, furniture, electronics, music, movies, basically whatever our heart desires and our pocket can afford. That's gear two. Now we have confidence and acquire a swagger because we know we got it goin' on, smooth sailing, cruising... Gear three. Time to look up and around and start making new friends of a similar bent, discovering new escapades together, road-trips are wonderful and new, house-parties galore, drinking sprees, general bonding. Gear four. Now comes gear five. ALL.OUT.MADNESS. We are now brothers-in-arms, comrades to the end, "We Die Together!!!" is an oft-heard chant, right up alongside "ALUTA CONTINUA!!!" As must all things incendiary, the fire flares out and starts to sputter. Not so many nights or road trips. Terrible Hangovers. Aches and pains after dancing. Hello gear four. Then home starts being a really cool place to hang out and catch some movies. Afternoon barbecues and quiet drinks with the guys over a football game with just the one night out a week now seems to be the norm. Gear three. It's still not enough. The guys conversation seems somewhat shallow of a sudden, their company not that fulfilling. What can this mean? This yearning for softness, this weakness? Now you start violating the 'dispatch' rule. No sleepovers for females? A thing of the past. Strange things are afoot. Females are interesing for more than just their bodies. You clandestinely go on a couple of lunch-dates (the horror). Gear two. You go public with your affinity for women beyond just the usual graphical physical descriptions and acts. Some of your buddies are understandably shocked but even MORE shocking, some can relate! Emboldened by your frankness they too disclose this newfound consummate creature, WOMAN. Howdy, gear one. The multiple attachments have coalesced into one and you are now officially hooked. On the occasional boys' night out or escapade you feebly proclaim '..aluta continua' to your mates not even managing to convince yourself. She or you have moved in and the more quality time you're spending with what you now reaise is your better half suddenly and mysteriously bears fruit (yeah right, you both know you stopped using condoms WAY back). You are pregnant. Unto us a child is born, gear two! You must address all the ruckus your unlicensed union is producing, parents up in arms but secretly rejoicing, friends in now abject shock, yourselves (yep, plural now) thoroughly confused but making do. You manage to pull a rabbit out of a hat, the families meet, you arrange and hold a ceremony, you are a married man mate! Gear three. Which is where I am at the moment and where the analogy must pause for now. Watch this space. Yonks since I last published to my blog, been forever. So many reasons behind this but most prominent of all has to be facebook. Finding myself forced to cram what I'm feeling, thinking, seeing into a one-liner witty status update I have become accustomed to even thinking that way. Picking out natty phrases from posters I see and books I read to store away for future updates is now second nature. Now it dawns on me that this is in reality blinkering my creativity, stifling my expression. So I must relearn the art of posting random thoughts. A non-themed blog that does it's best to replicate the mish-mash of my life experience. Perhaps one day these postings will serve as nifty markers for my memory of these times. Thus do I announce my attempt to return to the blogosphere, to break the yoke of the one-line status update, to once again liberate my writing! Which makes the title of this post a double entendre! In what is a major first for our fledgling association, the ICT Association of Malawi (ICTAM), we will host the 6th International Conference on Open Access (IOAC2008). This not only speaks volumes for the amount of recognition we are beginning to receive beyond our borders but also of the tireless efforts of some selfless individuals in promoting our agenda. Honourable mention here goes to our president, Boster Sibande and the chairman of the organising committee for the IOAC2008, Charles Govati. The theme of the conference is "Open Access to ICT for Social Economic Growth" and we will be hosting it in collaboration with The Royal Swedish Institute of Technology (KTH) and The Open Society Initiative for Southern Africa (OSISA). Open Access in the context of Communication (Open Communication) means that anyone, on equal conditions with a transparent relation between cost and pricing, can get access to and share communication resources on one level to provide value added services and on another level in a layered communication system architecture. There is currently a high momentum in the deployment of infrastructure such as optic fiber, wireless technologies and the like. It is also the advancement in the use of ICT in general such as through mobile phones and multipurpose telecentres. If used wisely, we believe these developments can facilitate the provision of relatively inexpensive, easily accessible, diversified and expandable ICT services. The objective of this workshop is to identify and share experiences on affordable and cost effective ICT technologies around the globe. Based on Open Access principles, the workshop intends to address ICT as a tool that will bring developmental change to the society at large. The call for papers is now out and we're encouraging the participation of academicians, professionals, researchers, planners, political leaders, innovators and the private sector. It will be hosted at the Crossroads Hotel, Lilongwe, Malawi from the 12th to the 14th of November 2008. More details can be found by clicking on the link in the this post's title. If you can make it, please attend, we look forward to hosting you in the warm heart of Africa! In this day and age of skyrocketing fuel-prices (4$ on Brent crude this week alone! And the week isn't even over yet. ), World-economies playing the rope-a-dope trying to bear the brunt of punishing fiscal blows and food shortages galore, with Governments at wits end on how to maintain a semblance of normalcy, we begin to reap the bitter harvest of capitalistic avarice. No one is angrier than the rich whose stockpile of money dwindles in value day by day. Conversely, the poor wake up to just another dreary day, same old struggles, taking pleasure in the simplest of things, a warm meal, somewhere sheltered to sleep, health. Maybe harder than the day before, but in hardship monotony is the order of the day. Those whose lofty dreams of success suddenly seem to be vanishing at a steady clip beyond the horizon start to despair and seek contentment in their statuses quo. The World ticks over, life goes on, time marches on. The panaceas for these woes are myriad, solace is sought in many different ways. Different strokes for different folks. I find myself adrift not really wanting to settle one way or the other. Into despondency or into complacency. Into Pollyanna optimism or prospective euphoria. Maybe some sage philosopher has already catalogued this sensation and all that remains is for me to chance upon their writings and find myself bedazzled by the glowing relevance of it all. Still I press on, hardly engaging yet not letting go completely. I wish I was smart. Really smart. So super-smart I could think up a functional solution to the maladies that ail African politics. The superbugs, XDR strains that are our inheritance from the liberation struggles of the 20th Century. As a continent even the most-promising, the most developed, the richest countries have these people lurking around their corridors of power, barnacles even a crowbar couldn't dislodge. Sapping the very lifeblood of the common man they posture and preen, lobby and plot, so intricately involved in their mad powerplays that they cannot smell the dawn of a new age. So rapt in their controversies they can no longer see the havoc they wreak. So lost in their faded dreams they have forgotten the ideals of their youth. No verve left in them these winded bagpipes creak out their dying notes tenaciously clinging on for the sheer sake of it, not even knowing why. It's gotten so bad that none of the young intellectuals and visionaries want to go anywhere near politics. The image is tarnished and we live in perpetual fear of becoming like these frightsome spectres who attract sympathy at best and rancid loathing otherwise. Free from the colonial influences that bound us (are we?) we find ourselves clogged in the muck of internecine and narcissistic ambitions. Kenya, Zimbabwe, Mali, Nigeria, Somalia, Malawi... Politics, Politicians, pitiful people. Is it all a game one wonders? A dream perhaps? Shall I wake up and find functional governments, working assemblies, responsible leaders allowed to rule in peace? Can I hope?